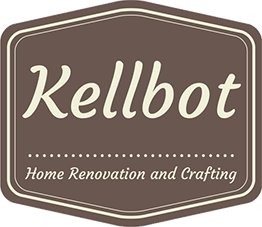 A million last-minute to-dos for Labor Day - Kellbot! | Kellbot! We’re having our first guests stay at the beach house… just in time for the end of summer! This meant my husband and I spent a lot of yesterday running around desperately trying to get the house clean and ready for people to stay over. In the morning, Chris took an entire Honda Fit’s worth of cardboard to the recycling center. Around 3pm we ran out for a Massive Emergency Trip to Target and Home Depot. This was an emergency because we desperately wanted to buy everything and get home before the Friday night shore traffic set in. We ran around like madmen getting all the last minute odds and ends we needed. 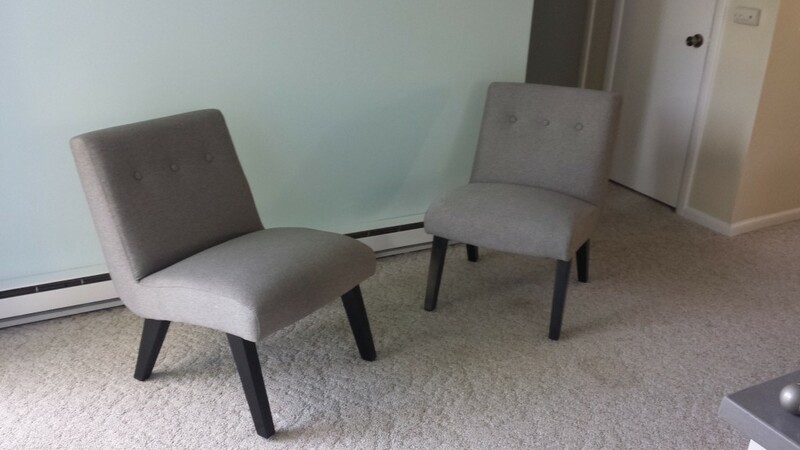 Somehow despite going in with a list and a strict “get what we need and get out of there” attitude we came home with two additional chairs. My husband had been eyeing them up for about a month and they were on clearance. 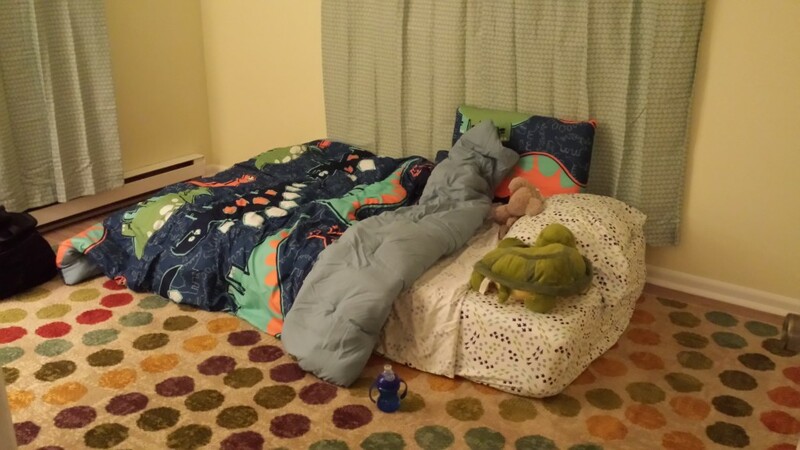 My daughter needed to give up “her” room for guests, so we let her pick out some linens so the little room she was staying in would still feel like hers. She went with dinosaurs (I was pulling for the truck sheets but got overruled). Once we got the cartridge out we brought it with us to the store and picked up a replacement for about $15. Installing the new cartridge was pretty straightforward. We went from getting ~0.4 GPM of flow through the shower head to 1.6 GPM (as reported by the hot water heater). The downstairs bathroom was supposed to be a straightforward replacement of the shower head. Unfortunately when I pulled the old head off I found it had a ball stem instead of the threaded stem the new head attaches to. So what was supposed to be a 10 minute project ended up with another trip to the hardware store to get a new shower stem. It took a little bit of force to get the old stem out but other than that it was simple to replace. Of course when I opened up the box to the new shower head and it was broken. Since we had just returned from the store I had absolutely no interest in going back. By some odd coincidence my in-laws next door had a spare shower head they weren’t using (???) so we grabbed that and now we have two working showers! With all the construction a bunch of the outlet faceplate screws have gone missing (yes, I know you’re supposed to keep them with the outlet so that doesn’t happen, no I did not do that) so I got a box of those, as well as a box of longer screws for the outlets in the kitchen need now that the backsplash bumps them out another 1/4″. The kitchen isn’t done, but we do have the essentials ready now. 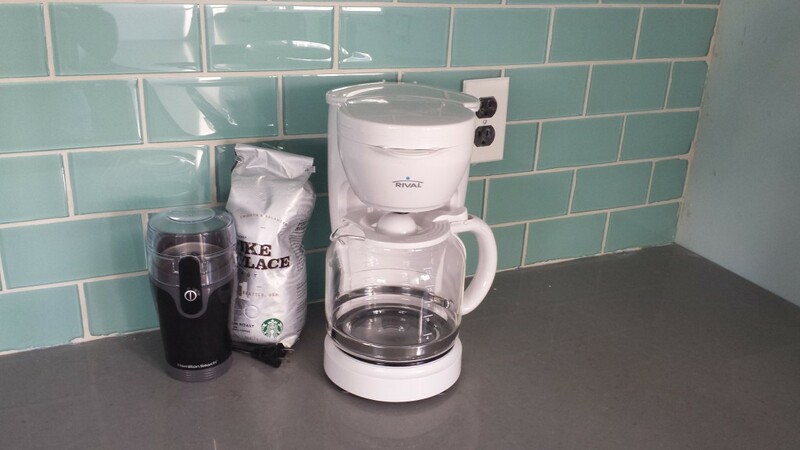 Oven, dishwasher, fridge, and most importantly: coffee maker. 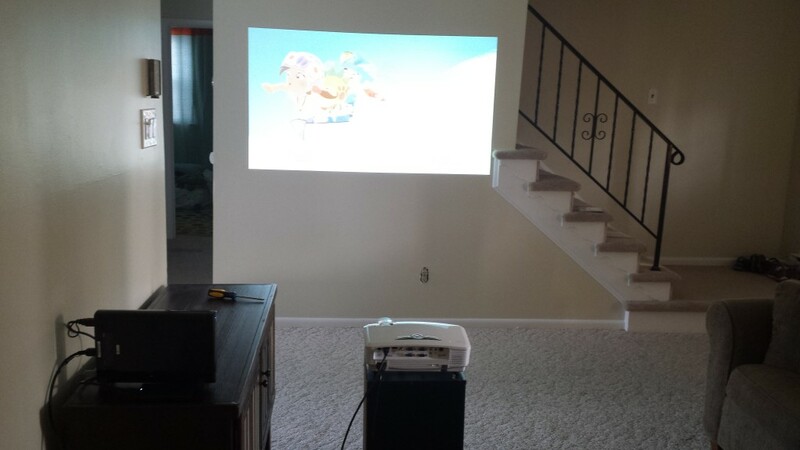 We don’t have a TV in the living room but Chris aimed a projector at the wall and brought his Wii U down. The couch in there is one Chris has had since before we got together, but it’s still in good shape despite many years of abuse from cats. So there’s somewhere comfortable to plop down and watch It’s Always Sunny in Philadelphia (or kids shows, I guess). We hung curtains in the bedrooms, did a ridiculous amount of laundry, scrubbed both bathrooms, vacuumed the hell out of everything, and managed to get the house to a place where we don’t have to apologize for its appearance. We’re in the home stretch now. I still have one major project (finishing the backsplash) and a lot of little fit and finish things (caulking the tile to the countertop, installing toekicks in the kitchen, etc). But I’m done with contractors (!!!) and after today’s Ikea delivery we’ll have beds in every bedroom. On Sunday I’m hoping to take a bunch of pictures of the house now that it’s free of construction debris. We’re so close! It’s finally happening! Just in time for summer to be over! The missing socket cover screws are my doing, sorry! I always rest them in the cover but then I’m not usually doing such a long term project.